Superhero movie trailers usually mean big business, but Warner Bros. seems to know that the upcoming Justice League trailer is different. This is a huge deal for a great many reasons. So, they are really going out of their way to build the hype. 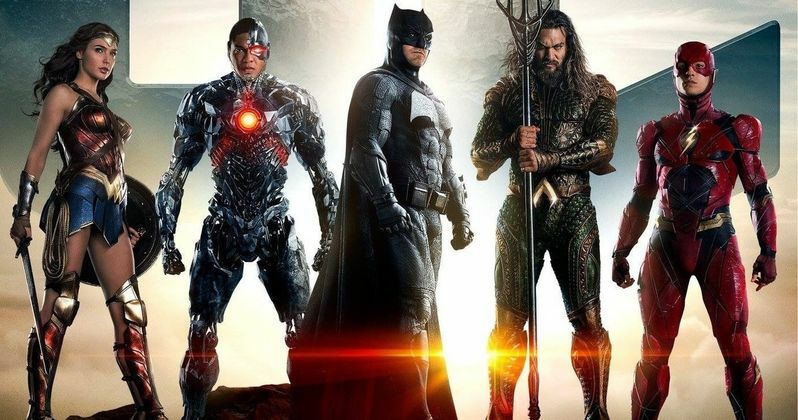 Their latest bit of trailer hype comes in the form of a brand new Justice League poster that features the heroes assembled together in stylish fashion. Warner Bros. released the new Justice League poster on their official Twitter account today along with the Justice League trailer reveal. Over the past couple of days, they have been releasing individual character posters and trailer teases for the individual members of the Justice League, save for the currently dead Superman. Now they decided to get the gang together on this new poster, with Ben Affleck's Batman in front of the new Justice League logo. Wonder Woman, Aquaman, Cyborg and The Flash are all present as well, and you can bet we'll be seeing plenty of them in action in the near future. Here is the official synopsis for the Justice League movie. It is interesting that, even though the response to Batman V Superman: Dawn of Justice and Suicide Squad was divisive at best, there seems to be a lot more excitement as opposed to trepidation about this new Justice League trailer. And for that matter, all of these new marketing materials in general. The fact is, people want this movie to be good and, if Warner Bros. can deliver, the sins of the past will very likely be forgiven. Even if the Wonder Woman movie is great, fans will probably be pretty unforgiving moving forward with the DCEU if Justice League is bad. Hopefully, Zack Snyder was able to learn from his mistakes and make the movie everyone wants to see. If nothing else, DC fans have a cool poster to hang on their wall now. The cast for Justice League includes Ben Affleck as Batman, Henry Cavill as Superman, Gal Gadot as Wonder Woman, Jason Momoa as Aquaman, Ezra Miller as The Flash, Ray Fisher as Cyborg, Amy Adams as Lois Lane, Willem Dafoe as Nuidis Vulko, Jesse Eisenberg as Lex Luthor, Jeremy Irons as Alfred Pennyworth, Diane Lane as Martha Kent, Connie Nielsen as Queen Hippolyta, and J.K. Simmons as Commissioner Gordon. Justice League is directed by Zack Snyder and is set for release on November 17. We've also included the new Justice League trailer for you to watch below in case you missed it.